Straight from her win at the Royal Highland Show, Beauty C1437 of Romesbeoch secured the championship trophy for the Ross Family, Romesbeoch, Shawhead, Dumfries, this is a record breaking 18 times the Ross name will appear on the Cholmondeley Perpetual Trophy. Beauty is no strange to championship rosettes, having won the Royal Highland Show weeks before and in 2014 she secured the junior championship at the Royal Highland Show, the Great Yorkshire show and the National Galloway Show held at Stewartry Show, she was also champion of champions at Moffat show. She is sired by Kirkmabreck Nimrod, who has produced many show champions and the 2015 Castle Douglas top price male, Windsor of Romesbeoch, a bull sold to Germany for 12500gns. The junior and reserve championship rosette went to John and Anne Finlay, Blackcraig, Corsock, Castle Douglas for Blackcraig Blondchen V506, she is by homebred sire Blackcraig Sid, who was an ET calf from Blackcraig Nimrod and Finmac Libby N195 a previous show cow who had many awards to her name including 2011 Galloway National Show at Wigtown show. 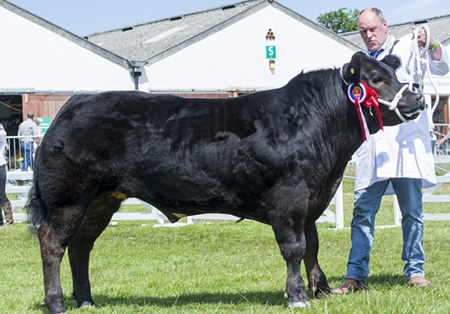 In the Commercial Cattle lines, a Galloway cross steer received the Champion steer prize, Diesel a Galloway x British Blue cross steer from Messrs P & E B Robson, Middle Horselyhope Farm, Waskerley, Consett, Co Durham took the top award. This April 2014 born steer is no stranger to championship awards having won the Native Championship at Beef Expo held at York in May. Yorkshire pulled out all the stops to make this one of the best shows in the summer season, the sun shone and it was even warm, which was a welcome change after the dreadful Scottish summer we have experienced. The enjoyment did not stop there, as once again David & Debs Heath and Emma and Will Gagg made us most welcome in the “Galloway office”. Their hospitality is second to none and their kind sponsorship of £100 to the exhibitor who had not shown at the last three shows was not won and will be competed for in 2016. Heifer, born on or between 1st September 2012 and 31st August, 2013.